It's Christmas time, and Santa's little elf has good reason to be satisfied with himself. Christopher Pyne's advertising campaign's a real treat! 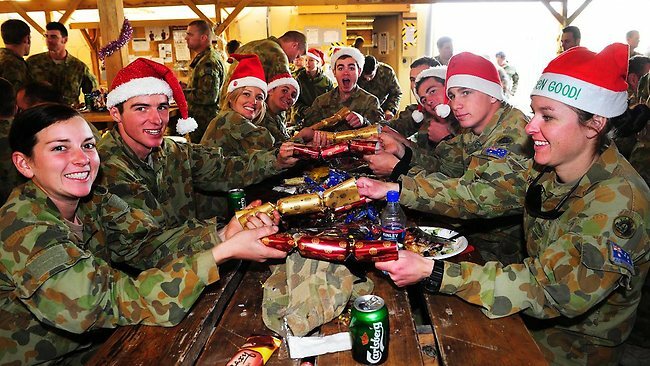 But I'm not sure we will be hearing much about our forces in the Middle East this Christmas. Who ever thought anyone would be nostalgic for TK? As this article for the Canberra Times suggests. Merry Christmas. You don't have to believe in anything to enjoy the presents . . .
Joyous Christmas! It’s that wonderful time of year when our minds are allowed to turn into happy slush; prodded into dazed stupefaction by jingles and gaiety until we remember what the true meaning of life actually is. So let’s pause for moment to appreciate the marvels and ingenuity all around us. And where better to begin than with our very own government. Let’s hear some hearty applause, first, for Santa’s very own little elf, the witty Christopher Pyne. Think he was downhearted when his university reforms failed to pass the Senate? No! A mere hiccup; no more discomfort than a couple of champagne bubbles tickling your nose, eh, Christopher? Everyone can learn from the way our merry trickster has reacted to the obstacle put in his path. If you don’t like the cards nature’s dealt you – ignore them! Pretend the setback never happened and turn to advertising to make everything right again. This is exactly what our friend the clowning funster has done. Launched a marketing campaign that one can only conclude is designed to get us laughing out loud. He couldn’t really believe we’re that stupid, could he . . . The ad’s amateur production values offer not a hint that a lot of your money’s been spent on expounding this tosh. The video’s so ridiculous it’s clearly designed to be humorous. Perhaps Joe Hockey got his millions and billions confused (again) when he was handing out money to fund the campaign. But who cares? Every other way of convincing the public the government’s got the right idea has failed – so why not see if silly advertising campaigns can do the trick? Alas, simply informing us that black is white is unlikely to change anyone’s mind. Yet all’s not lost, for the government’s providing priceless fun for all as we watch young Christopher making merry mischief. You can guess at the sophistication of the message from the opening. “Higher learning leads to higher earnings,” intones the bubbly voice of a young woman, fairly brisling with barely hidden excitement. She’s doubtless already acquired double degrees in law and statistics but, perhaps more importantly, she’s paid for them already. Of course she has – nobody could possibly be that enthusiastic if they faced an ever-increasing mountain of future debt still to be paid off. Then comes a graphic. This is mellifluously described (on the education website) as follows: “Stack of gold coins and green dollar notes increasing in size with male wearing glasses with Text: “Higher Earnings”. Crowd Cheering” (sic). This gives you a pretty clear idea of the intellectual level at which the government’s decided to pitch its campaign. With barely 68 half-true words, Pyne demonstrates that taxpayer funded enjoyment is priceless. It’s tempting to go on. But when I completed my degree in column-writing (Bachelor of Unlikely Life Lessons), I was taught any piece appearing in the days before Christmas must possess moral gravitas. So let’s extrapolate from this example: what can this advertising campaign possibly tell us about the world? Why, never to trust anyone, of course! You may occasionally wonder why the media exists. It’s a good question with an answer that’s beginning to appear increasingly irrelevant to our way of life. The internet has hit newspaper sales hard and is about to utterly destroy the free-to-air TV model. But don’t mistake the disintegration of a transmission technology (papers, television) for the elimination of communities. We don’t live alone and can achieve so much more by being together. Just before her own colleagues booted her out of office, British Prime Minister Margaret Thatcher famously insisted “there is no such thing as society”. Her point was that every individual needed to be self-reliant rather than bossed around and provided for by the state. But what her individualistic philosophy missed was that none of us can achieve anything without a framework to work within; and many of us need – through no fault of our own – a bit of assistance on our way through life. Society makes business possible – not the other way around. This is something the government’s just discovering, which is why it’s now turning to a mass advertising campaign as part of a desperate effort to convince us of something that’s so obviously incorrect. Don’t believe the inane blandishments that everyone will be better off if children are forced to bear the cost of education: any costs will always be passed on. Nothing is ever free in the new world order. The only question is who pays and are there some social goods that should be provided for free, in order to keep the world working smoothly. The government’s changes are simply an extension of their basic philosophical position, one that asserts the role of the individual and minimises the role of the state. But the trouble with the higher education changes is that they dramatically shift the line separating these two spheres, collapsing the role of society. Unfortunately, without some way of ensuring opportunity, this simply entrenches pre-existing privilege. Exactly the same process is currently occurring in China, where those ‘with’ are grasping every chance to ensure they continue accumulating more. Those ‘without’ have increasingly fewer opportunities to turn their lives around. This process doesn’t make for a happy society – but if you don’t believe such a thing exists, that probably doesn’t trouble you. It should. We’ll see how this particular project goes over the coming year. Personally, I suspect a competent government might be able to convince Australia to make this sort of radical change. This current collection of clowns, however, is a different matter. Oh, and one final thing. It seems our troops in Iraq are still on ‘diplomatic’ passports. Baghdad doesn’t want them doing any fighting. They prefer the Iranians. Ah ha Nicholas...did you think about auditioning for NIDA when you were a student ? The name of Nicholas Stuart could have been added to the esteemed list of Hugh Jackman, Richard Roxburgh, David Wenham, Hugo Weaving and Russell Crowe.